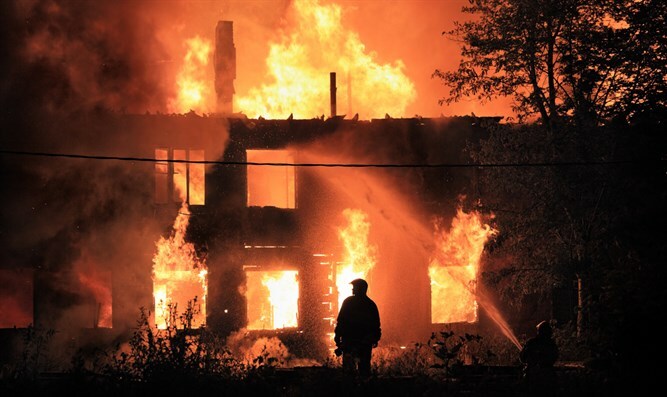 Arutz Sheva speaks with fire investigator about how residents can prevent the next fire. Following the recent tragedy in Beitar Illit, Arutz Sheva spoke with Chemic Engineering and Safety CEO Moti Freiberg, who also serves as a fire investigator. Freiberg warned that several issues need to be emphasized, such as the electrical system. "In every apartment there is a supply of electricity and a breaker box, via which electrical cables pass. These cables supply electricity for all of the home's needs, such as the refrigerator, washing machine, lights, etc. These breakers are sensitive, and are programmed to provide a certain amount of electricity. If a customer connects too many things to one outlet, there is more electricity flowing than the cables can hold, and the cables become too hot and burn," he explained. "This is an example of a fire that happens because of electricity use, and one of the danger signs is when the breakers fall and the electricity turns off. When this happens again, you need to call a certified electrician, who will take measurements and decide if it's necessary to raise the amount of electricity that the breakers can take, and switch cables which are too thin." Freiberg also mentioned several fire hazards commonly found in the home, such as Shabbat (Sabbath) candles. "There have been several instances in which people hung the candles over a couch, so that it would look nice," he noted. "Somehow it falls onto the couch, and people go to sleep and are almost burned in their homes. They managed to escape via the stairwell, and only via the stairwell, because the windows had bars on them." Today single-story homes must be built with smoke detectors, he added, noting that "the third danger, which is possibly the most serious, is the gas in the kitchen. Cooking gas is very flammable, and when there is a leak from a pipe, the gas collects in the apartment and when it becomes concentrated enough it can ignite from every electrical spark in any outlet, even if you don't see it." "The fourth danger [comes from] mobile phones and laptop computers, which like bicycles run on batteries. When you charge the lithium batteries, you need to ensure that it charger meets the standards, and won't overcharge the item or cause the battery to explode, [both of] which can lead to fires. "Don't charge on a pillow or other flammable items. The phone and computer heat up and can ignite the bedspread. Just the heat can ignite the sheets. There's a very interesting natural phenomenon, in which each item has its own fire threshold. Meaning everything has a temperature at which it ignites even without a flame. So a computer lying on a sheet or bedspread heats them to the point where they ignite even without a flame. "There's a certain culture here, with its advantages and disadvantages, in which people are sure of themselves and say, 'It'll be fine.' There are nations which honor us for our daring, but we don't need to take it to the extreme. "The issue is that the authorities don't advertise this enough. The Fire Authority operates well, and there are standards and they try and do a professional job, but residents, not just businesses, need to take action on a regular basis."